Cicis Facilities are typically located in commercially-zoned shopping areas. Due to the cost of land acquisition and new construction, the premises are normally leased. 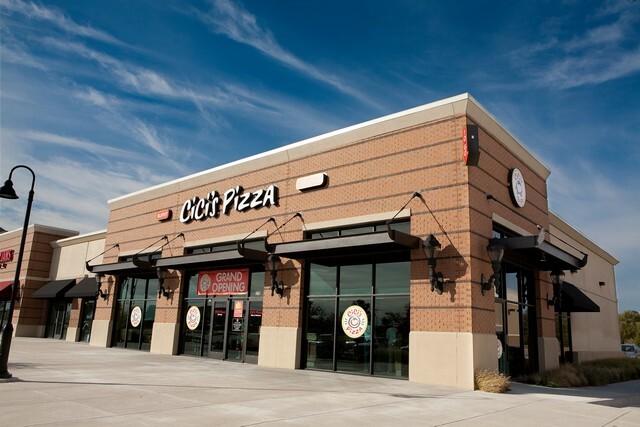 The estimates provided for Restaurants and Units, respectively, are based on the cost of adapting the prototypical architectural plans for the finish-out of a Cicis Restaurant containing approximately 3,000 to 4,000 square feet. Some landlords are willing to contribute towards the cost of finish-out, sometimes referred to as tenant improvement funds, which may reduce the overall leasehold improvement costs, but is not included in the chart because, if offered, the terms will vary. The impact fees in some areas may substantially exceed $10,000 for a Cicis Restaurant. Impact fees are assessed by certain jurisdictions based on a predetermined formula established by the jurisdiction. Impact fees are generally based on the expected impact of the Facility on the infrastructure around the Facility, including traffic infrastructure and water and sewer systems. The amounts for Cicis Restaurants include the cost of the furniture, fixtures, and equipment, including 3 ovens; decor items required for the Restaurant; and the cost of the Cicis-approved POS System, including the initial annual fee, training, and installation. These amounts represent your cost for interior and exterior signage. The cost of signage may vary significantly depending on the size of the signage, number of signs, the location of the Facility, and market conditions. This amount represents an estimate of your insurance premiums for 3 months. This amount represents estimated health and various operating licenses required at the local, regional, or state level. Cicis estimates that this range will cover the cost of the initial smallwares package including pans, utensils, and dishes. This estimate also includes the cost of food, beverages, condiments, and supplies for approximately the first 7 to 10 days of operations. You must carry out a grand opening promotion for the Facility in compliance with Cicis’ written specifications. The cost will vary based on Cicis’ assessment of the location and marketing conditions of the Restaurant. The grand opening promotion will begin shortly before or after the Facility opens for business. Grand opening funds must be used within 90 days of the Opening Date. These fees include the costs of recruiting and training your key employees. Cicis provides initial training to your initial Managing Principal, Operator, General Manager, and 2 Assistant Managers for your first Facility at no additional charge. Therefore, these amounts include only your out-of-pocket costs for the training of these people. Wages for the Managing Principal and Operator, while in training, are not included. These estimates include the costs of legal fees and architectural and/or engineering plans as well as the costs of prepaid rent, a lease deposit, and utility deposits. The prepaid rent and the lease deposit are estimated to be one month of rent charges. These funds will be used, among others things, to train your crew, compensate for higher than normal food and labor costs during the start-up phase, and provide general working capital. These amounts do not include any estimates for debt service and related closing costs or for payment of a Managing Principal’s or Operator’s salary during pre-opening. Cicis relied on its experience in the industry to compile these estimates.